Financial derivatives, convertibles and futures contracts make my eyes roll back and my head ache. 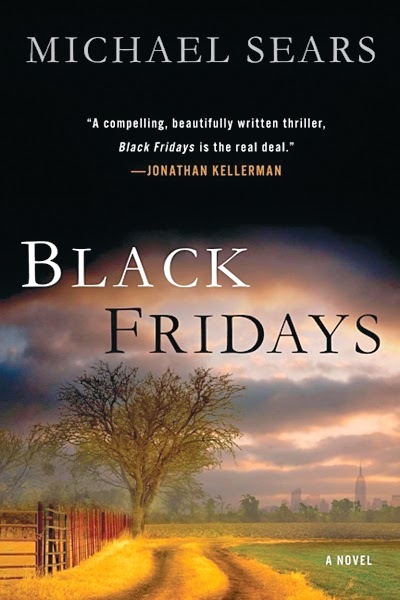 With misgivings, I chose Black Fridays by Michael Sears as Goodreads.com called it a financial thriller. I’m glad I ignored the obvious oxymoron and ordered the book. The 341 page novel published in 2012 by the Penguin Group opens with a graphic description of a woman’s fall from thirty-eight floors on Wall Street. The NYPD closes the case as a suicide even though a witness suggests a suicide doesn’t scream falling to her death. After this grisly prologue Jason Stafford leaves Otisville, the federal prison where he’s done his time as a white-collar criminal. He wants to regroup with his wife and autistic son and make a new life. Angie has other alcohol-soaked ideas that don’t include Jason. He discovers her treatment of their son has been deplorable during his incarceration and removes the boy from the abuse. Addled Angie wishes him good luck and seems out of the picture, temporarily as it turns out. Because of Jason’s criminal insights Weld Securities hires him to investigate some trading inconsistencies of their own. The suspicious death of an up-and-coming trader and the suicide of another are at the foundation of the unfolding mystery. Jason begins to discover an elaborate financial scheme as he tries to pull his life together; “The Kid” becomes the center of his world. Another player in his new life is Wanda, who works as a clown’s assistant; really, I’m not kidding. He calls her “Skeli.” She’s beautiful, smart and an ex-Broadway performer and it just might work. With the crucial aid of youthful Spud, a utility infielder type of Wall Street trader, Jason starts drilling into some fishy trading patterns. They’re led to a firm called Arrowhead, a British hedge-fund and a trader named Hochstadt. Bill Stockman the Weld CFO seems innocent; Sanders is a dead trader; Avery is a legal-type in Compliance; Stafford scrutinizes all. Angie meanwhile puddles like a wicked witch back into the trailer trash she had risen from when she married Jason. Sears writes well and tells a good double-barreled story: Will Jason get to the bottom of the Wall Street mystery and who will get custody of the boy? People lie, people die and the whole while Sears kept my financial phobia headaches at bay. I found Black Fridays to be an excellent investment of time. It’s available at the Portland Public Library.